You are here: Home / Patient Education / Robotic Assisted Surgery / What is MAKOplasty® Total Hip Replacement? 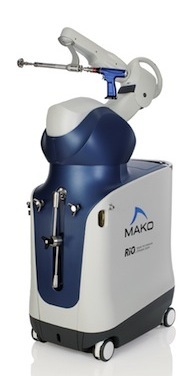 MAKOplasty® Total Hip Replacement is powered by the RIO® Robotic Arm Interactive Orthopedic System. It is indicated for adults who suffer from non-inflammatory or inflammatory degenerative joint disease. 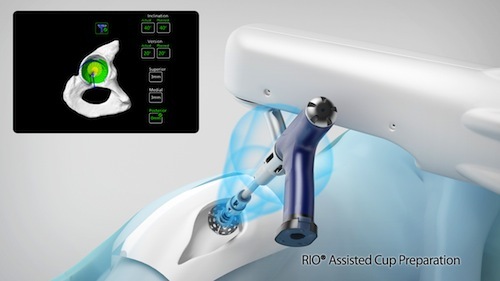 The RIO® robotic arm advanced technology allows surgeons to achieve a new level of accuracy. Who is a Candidate for MAKOplasty®? If your symptoms aren’t responding to non-surgical solutions, or your pain can no longer be controlled by medication, you may be a candidate for MAKOplasty® Total Hip Replacement. Failure to respond to non-surgical treatments or nonsteroidal anti-inflammatory medication. If your surgeon determines that you are a good candidate for the MAKOplasty® procedure, a CT Scan will be taken of your hip one to two weeks prior to surgery. This is used to create a patient specific 3-D model. A surgical plan is then created for the placement and alignment of the implants before surgery. During surgery, the robotic arm guides the surgeon in preparing the socket in the pelvis and positions the impants optimally. Real-time information and images allow your surgeon to know and control accurate implant placement, which can be difficult to achieve using traditional surgical techniques without a robotic arm. Only a surgeon can determine if MAKOplasty® Total Hip Replacement is right for you.